I hate that I have to keep asking myself this question, but who decided that racism was geared to make a major comeback in 2013? Since roughly the springtime, there have so many incidents reported that no matter your skin color, if you have an iota of love, respect, and hope for the human race, you may at one point really just wanted to stop in your tracks and ponder, “Is racism really over?” Post-racial America? Yeah. Maybe there was a one-year max on that commitment. From the Trayvon Martin trial; poor Paula Deen’s (if I have to mention her name one last time) major faux pas, attacks on Marc Anthony singing the national anthem despite being born and raised in Spanish Harlem of New York because of his Puerto Rican ancestry; cries of how could Miss America be Indian-American, and the interracial family posing as the new American family for an innocent Cheerios commercial, now the coming out the woodwork allegations of racial discrimination at department stores like Barneys New York and Macy’s (which have surprisingly garnered and sparked nationwide discussions), now we have the return of blackface. I really don’t know what to tell an individual that after years and years of higher education training and documentaries and films highlighting the hurtful connotations of the practice that one would think it’d be okay to do, and in a such public manner. Every year just in time for Halloween season, images from just trying to have a good time parties roam the Internet and the sights are cringe and shake your head worthy. From some of America’s most elite college campuses to the clubs of La-La Land, some persons of the Caucasian persuasion take it upon themselves to don brown paint on their faces in order to mimic black people, famous or not. Dancer and actress Julianne Hough, despite her admirable talent for the stage, clearly had dim light-bulb in her head when it came to racial sensitivity as she dressed up as “Crazy Eyes” from the acclaimed Netflix hit Orange is the New Black in noticeable tan makeup. Really? 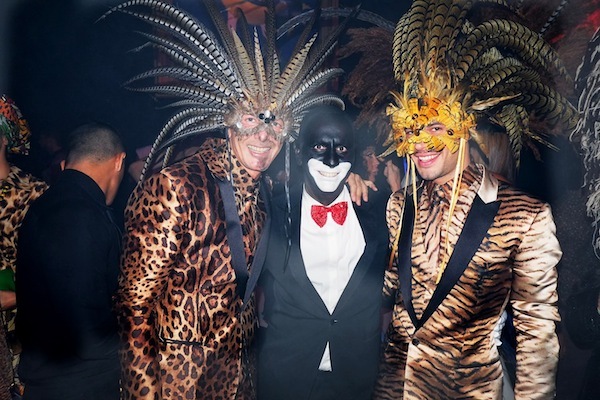 High-end fashion designer Allessandro Dell’Acqua literally painted tar paint on his face for a themed “Africa Disco” party in Europe that 100% recalled the days of white performers in vaudeville, and he wasn’t the only lame that found that get-up acceptable for that event. And it gets worse. Online, a photo recently surfaced of a trio attending a party in their modest town, with two of them each taking the role as George Zimmerman (wearing a shirt that says “Neighborhood Watch”), and Trayvon Martin in which a young white man donned borderline black paint on his face and wore a gray hoodie with a red splat in the middle. Totally disgusting. Enough is enough. As the powerful film 12 Years a Slave, hit American cineplexes earlier this October, receiving well-deserved rave reviews for its heart-wrenching depiction of a once free black man that experienced life on the other side of darkness, can someone please explain to me, to us otherwise thoughtful of history people, why some of you think this is okay? Do you not only see how foolish you look, how abundantly ignorant you really are, and how plain, straight up, emotionally adverse it is? And this kind of condoning of prejudice isn’t just limited to black people, though they’re largely the most imitated. Culturally appropriating any race and their customs is a hard line to thread and often crosses over to being offensive. Look at how the media, especially black and proud sites, attacked Miley Cyrus for her adoption of what we now refer to as “twerking” and her trying to be down gimmicks. Dressing up as a Holocaust victim or a member of Adolf Hitler’s Nazi crew is also unacceptable just to make that clear. It’s completely possible to dress as a celebrity or figure (non-controversial) without having to reach for the pseudo skin-tone face paint. Everything that can be said has been said in denouncing blackface as an act. At this point, apologies are not accepted because that person should’ve known from the inside out that to even think of doing blackface is highly unfavorable and unsympathetic to the nation’s history and the people it immediately refers to. So many that portrayed blackface were probably the same ones that placed a ballot for Barack Obama twice during his Presidential tenure. How can you do both? Enough with the ignorance and pretending you don’t know better. People of color around the world, doing their part to better their community, didn’t work all these years to regain the dignity that was robbed of their ancestors and legacy for you to smear black or brown paint on your faces accompanied by distasteful costumes. No one looks more stupid and unpatriotic than you. Below is a video montage that ended Spike Lee’s satirical exploration of blackface, Bamboozled, that was released in 2000. It’s a three minute clip that’s puissant in its delivery of why this is never okay.